The cottage styling of this 42-inch diameter round pedestal dining table set is a perfect choice for your casual dining space in an eat-in kitchen or breakfast nook. 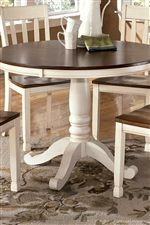 The table takes inspiration from classic farmhouse decor with its two-tone finish that includes a burnished brown finish top and cottage white paint finish for the turned single pedestal base. The slat back side chairs are finished with cottage white paint with a burnished brown finish on the comfortable saddle seats. The table and chairs are constructed with select birch veneers and hardwood solids. This table set will become a place you will love to gather for meals with family and guests. 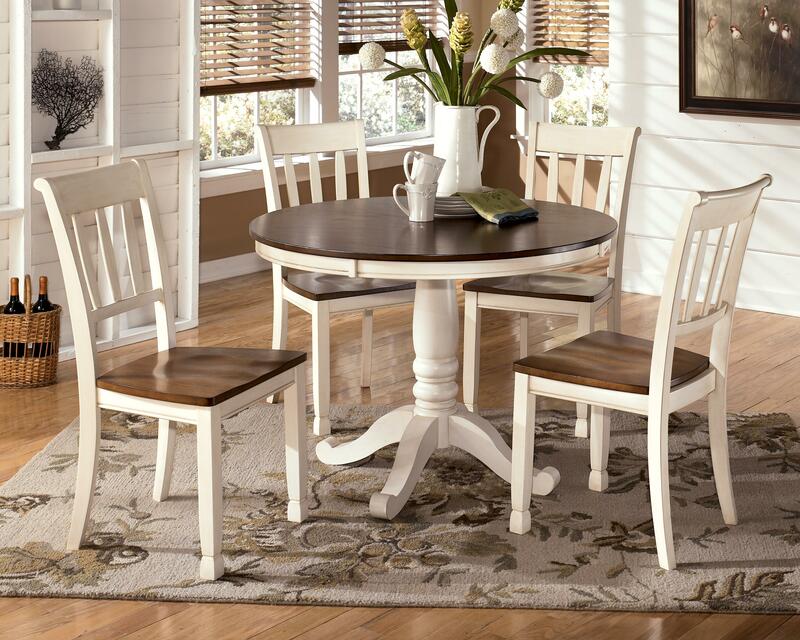 The Whitesburg 5-Piece Two-Tone Cottage Round Table Set by Signature Design by Ashley at Miskelly Furniture in the Jackson, Pearl, Madison, Ridgeland, Flowood Mississippi area. Product availability may vary. Contact us for the most current availability on this product. Handles & Hardware Antique bronze color hardware knobs and bin pulls on server. Case Construction Constructed of Select Birch Veneers and Hardwood Solids. Glued and screwed corner block construction. The Whitesburg collection is a great option if you are looking for Cottage furniture in the Jackson, Pearl, Madison, Ridgeland, Flowood Mississippi area. Browse other items in the Whitesburg collection from Miskelly Furniture in the Jackson, Pearl, Madison, Ridgeland, Flowood Mississippi area.